This Cottage Beef Pot Pie with Potatoes and Parsnips is an easy one-pan meal with hearty, rich flavors and virtually no cleanup. 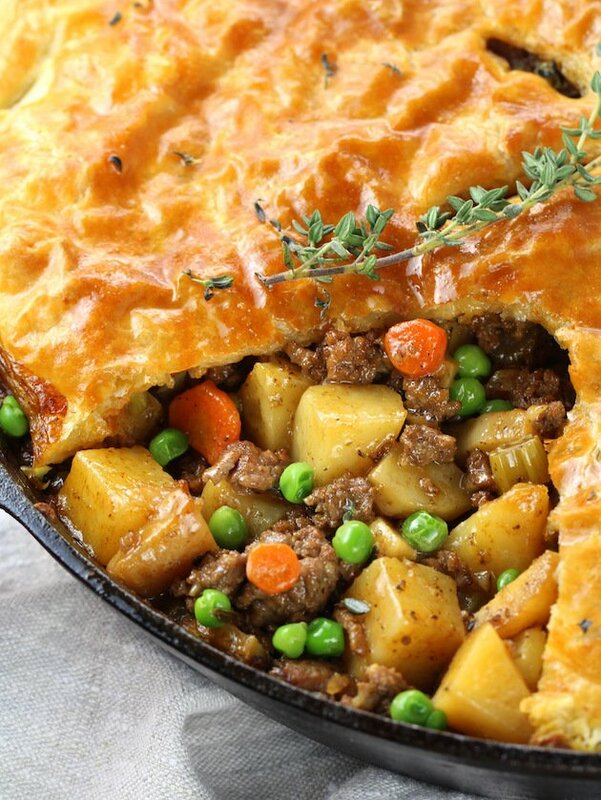 With lean ground beef, carrots, peas, parsnips, potatoes, in a beef stock and stout beer sauce, all topped off with a light and crispy puff pastry crust… this savory pie is comfort food at its best! 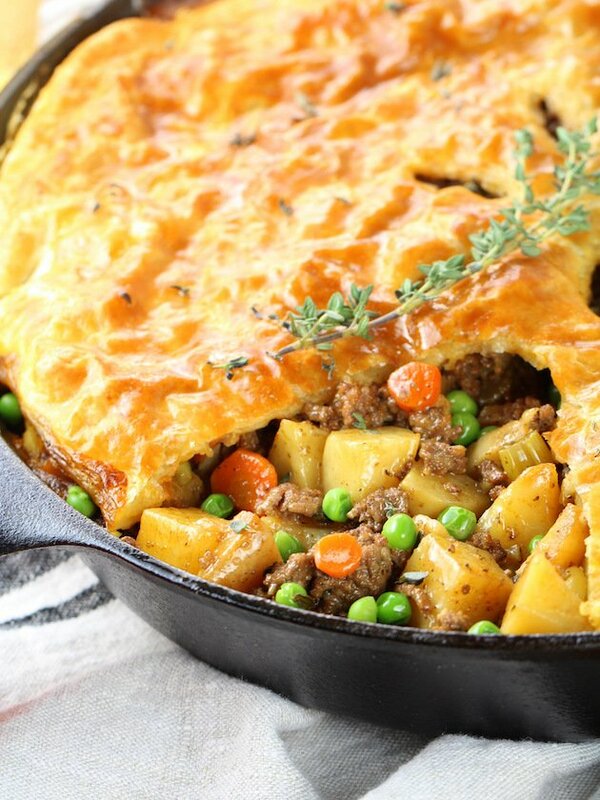 Today we’ve got a yummy Cottage Pot Pie recipe for you! Pot pie has to be the epitome of comfort food. Hearty meat and veggies enveloped by a crispy crust. Mmm, mmm! 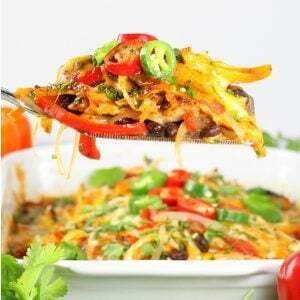 Cottage Pie is made with minced meat and topped with a layer of mashed potatoes. 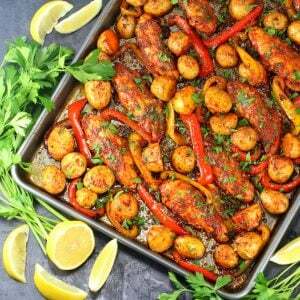 It made its debut back in the late 1700’s in Ireland and the UK and has become a popular dish worldwide. It can also be referred to as Irish shepherd’s pie. Is Cottage Pie The Same As Shepherd’s Pie? Cottage Pie is often referred to as Shepherd’s Pie, which is very similar, but traditionally Shepherd’s Pie is made with lamb and not beef. Which makes total sense – right? Shepherds look after sheep, therefore the dish is comprised of lamb. They were both considered peasant meals, because they were an economic way to use leftover roasted meat. 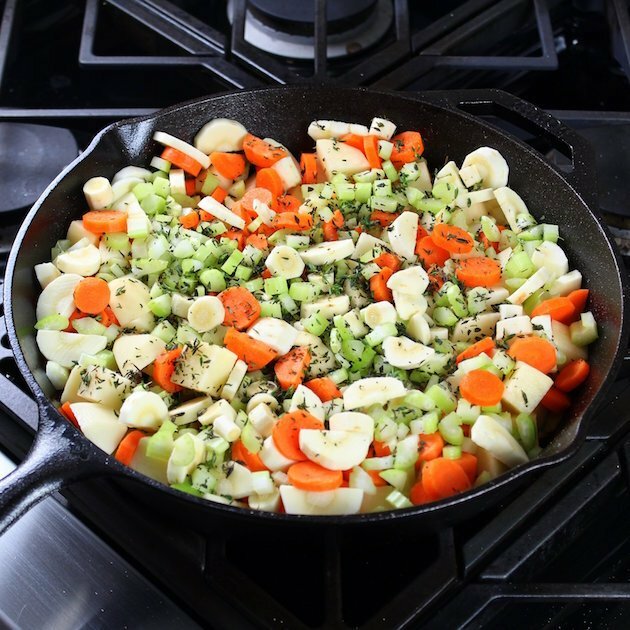 What Goes In A Cottage Pot Pie? 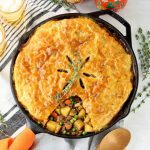 This beef pot pie is filled with so many yummy flavors: lean ground beef, healthy veggies like carrots, peas, parsnips and potatoes, a beef stock and stout beer sauce, all topped off with a light and crispy puff pastry crust. 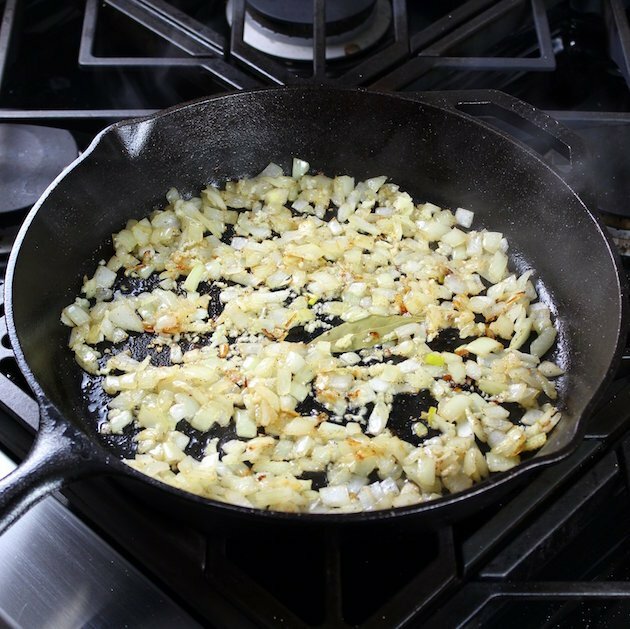 To start, I use a cast-iron skillet so I only have to use one pan for the entire dish. What an added bonus… delicious with no dishes! 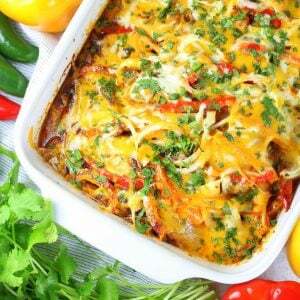 1 – Saute ground beef. 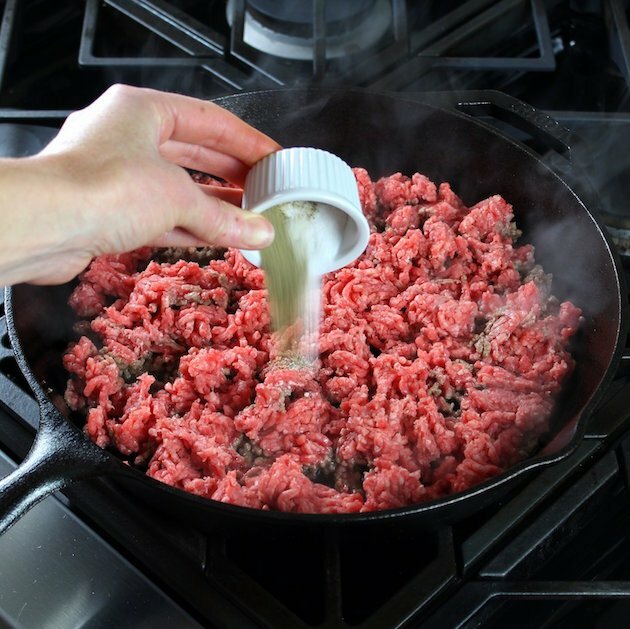 I sauté the ground beef with some salt and pepper until it’s no longer pink. Then strain off the fat and set the meat aside. 2 – Saute Onions. Next, I add the onions to the same pan and saute for 5 minutes. Then add the garlic and a bay leaf and cook for 1 more minute. 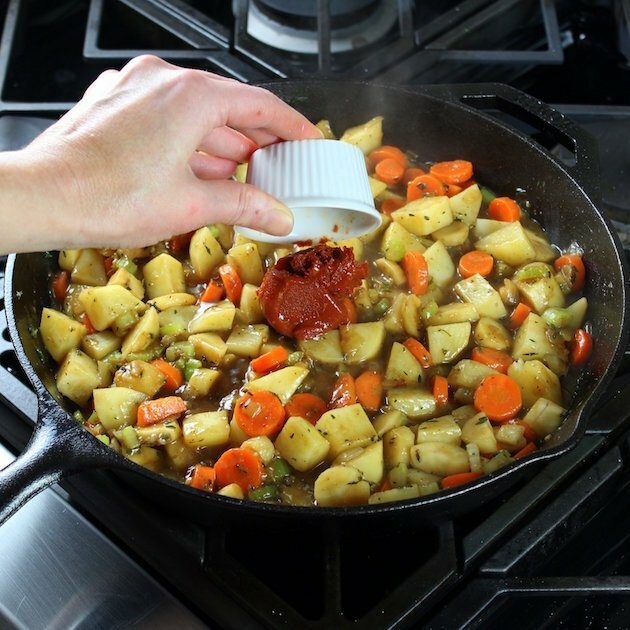 3 – Add root vegetables. Next, I stir in the potatoes, parsnips, carrots and thyme. 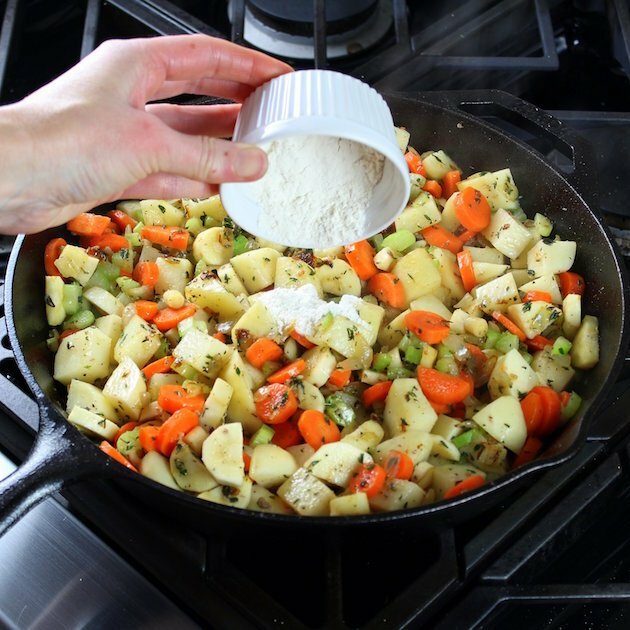 Then add a little flour for a thickener. 4 – Add the beer! (and beef stock). Then in goes the beef stock, beer, Worcestershire sauce, tomato paste, and a little more salt and pepper. 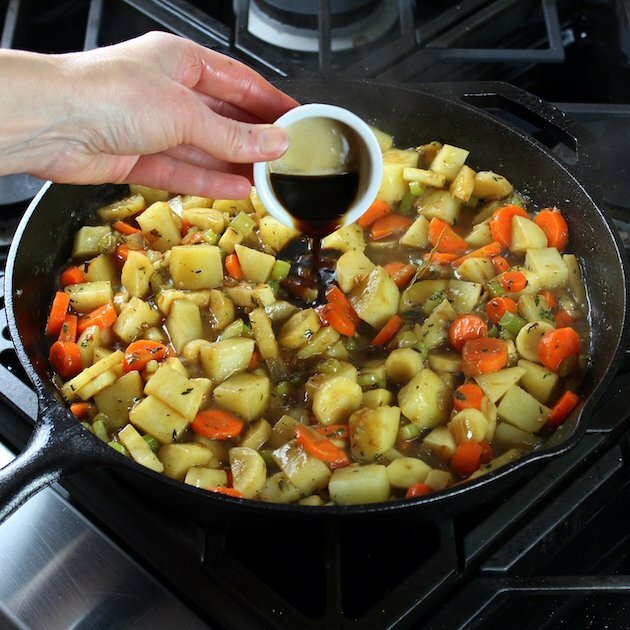 5 – Simmer on stovetop. I let that simmer for about 10 minutes, then stir in the peas and cooked ground beef. 6 – Top with puff pastry. I top it off with the puff pastry dough, and carefully crimp the edges on the inside of the pan. Finally, I make a few slits for the steam to release, and brush the dough with a beaten egg yoke. 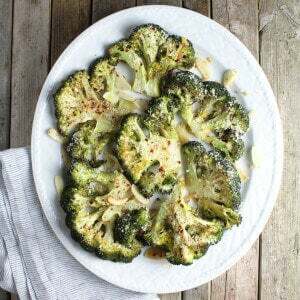 7 – Bake in a 400-degree oven for 15-20 minutes. 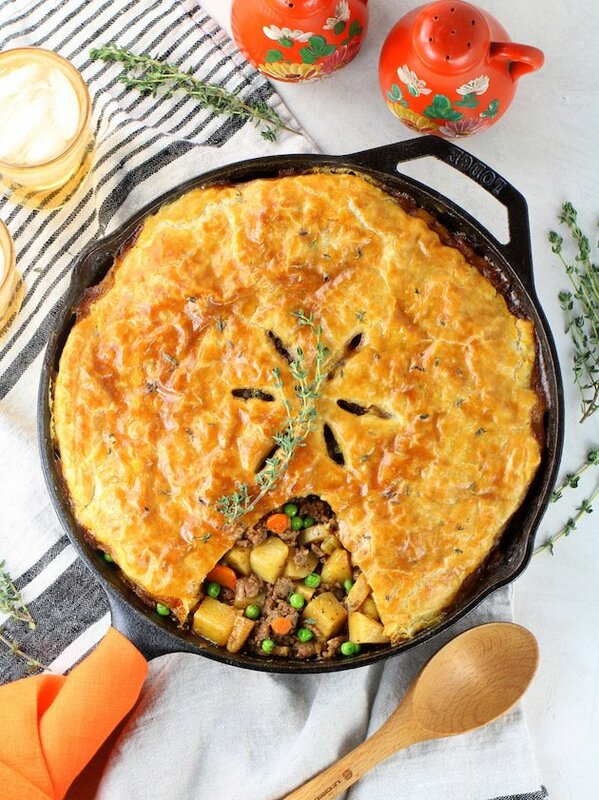 And there you have it: Cottage Beef Pot Pie with Potatoes and Parsnips… A yummy, hearty, meaty pot of goodness ready to be devoured and become your family’s new favorite meal! 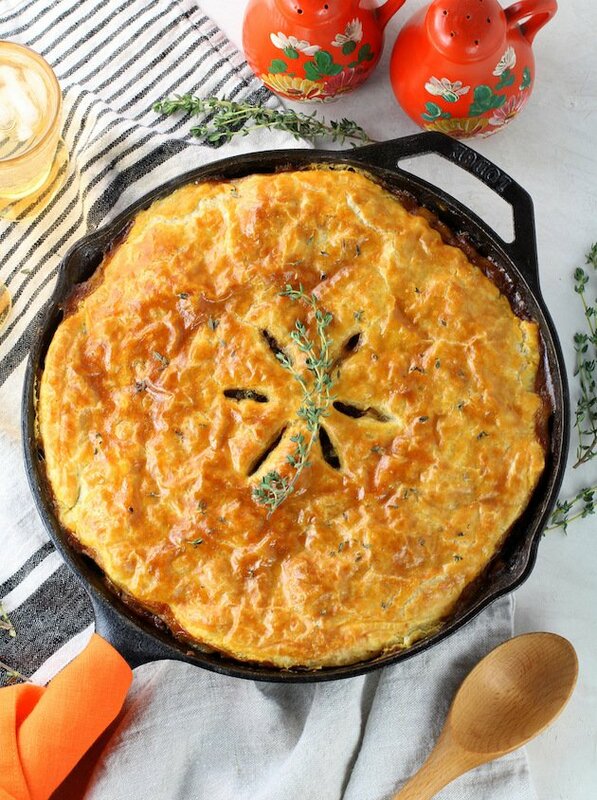 This savory pie is comfort food at its best! 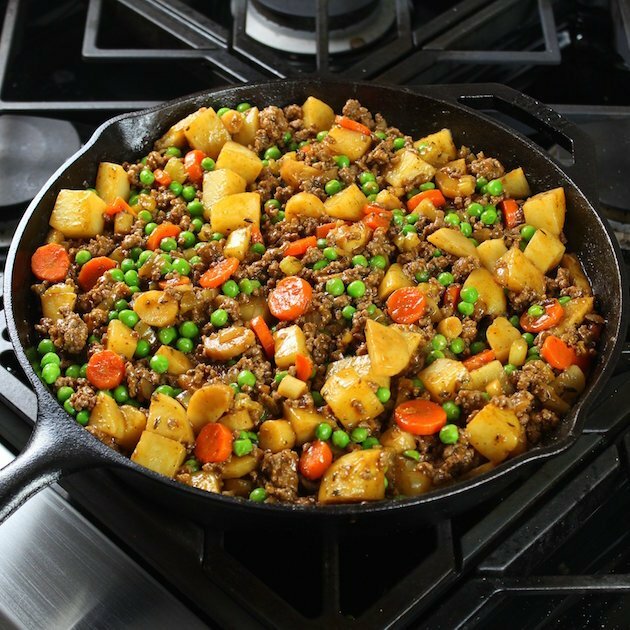 In a 12-inch ovenproof skillet over medium-high heat, add the ground beef, break into small pieces with a wooden spoon, and season with 1 teaspoon salt and pepper. Cook until no longer pink then drain the fat, remove the meat from the pan, and set aside. 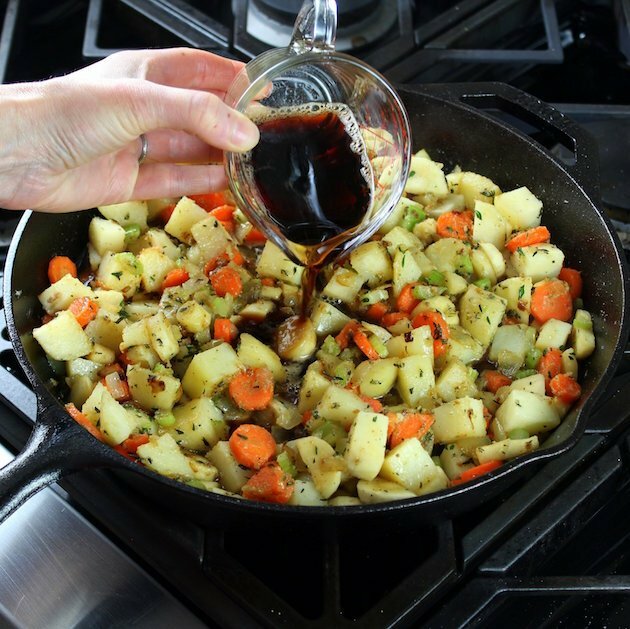 Warm 1 tablespoon olive oil in the same pan. Add onion and cook 5 minutes. Add the garlic and bay leaves and cook one more minute. 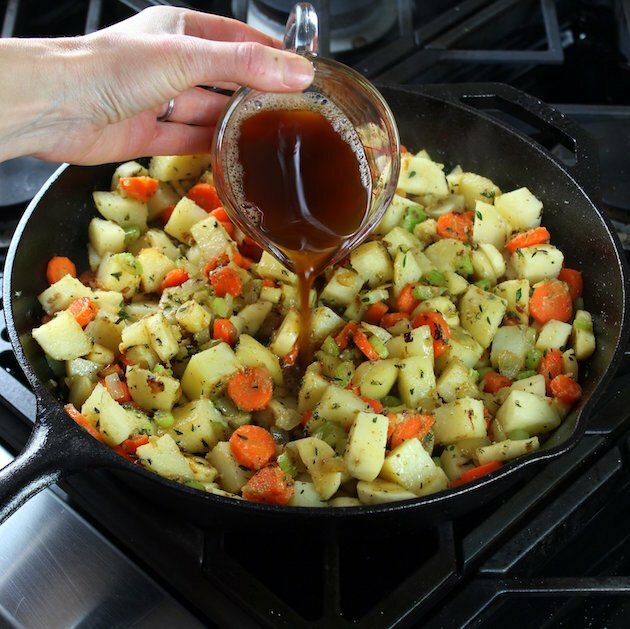 Add thyme, carrots, celery, potatoes and parsnips to the pan, and cook 5 minutes. Sprinkle with flour and cook, stir for 1 minute. Add the tomato paste, Worcestershire sauce, and beef broth to a measuring cup and stir together. Then add the mixture and the stout beer, 1 teaspoon salt and pepper to the veggies, stir and bring to a simmer. Cover and cook the mixture for 10 minutes, then stir in the peas, and cooked ground beef. 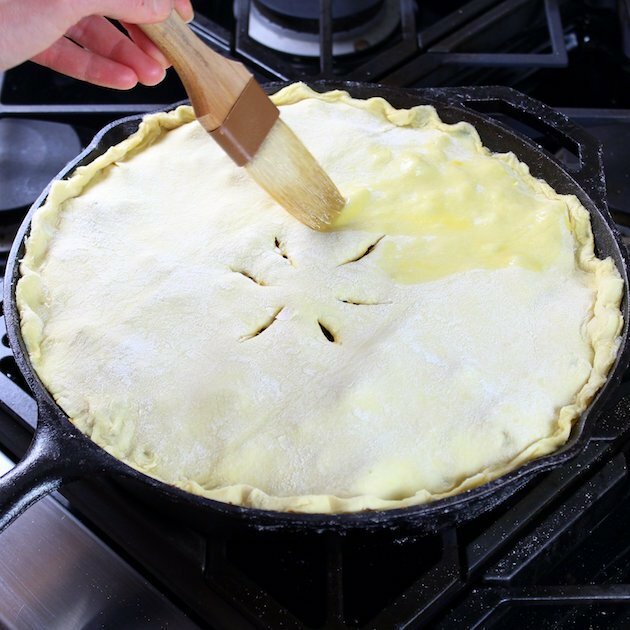 Remove the bay leaves then cover the pan with the puff pastry dough, carefully press and crimp the edges to fit inside the pan. 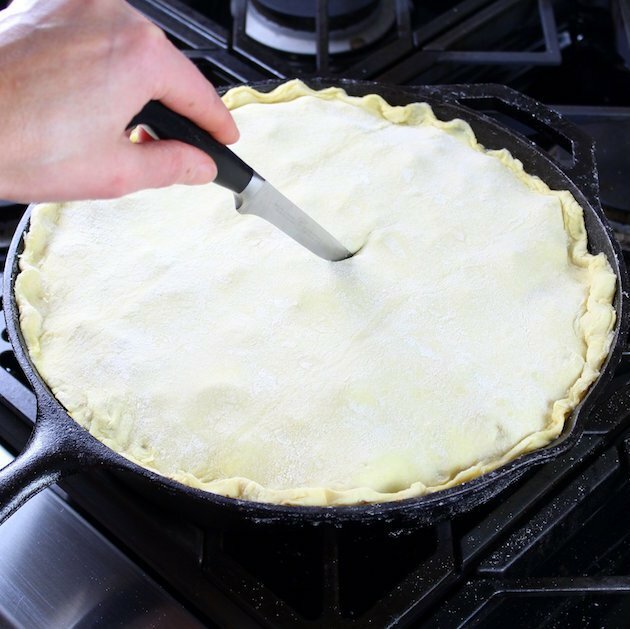 Brush with the egg wash, make 6 slits with a sharp knife in the center of the pie, and bake at 400°F for 15- 20 minutes or until pastry is golden. Let the pie rest for 5-10 minutes before serving. 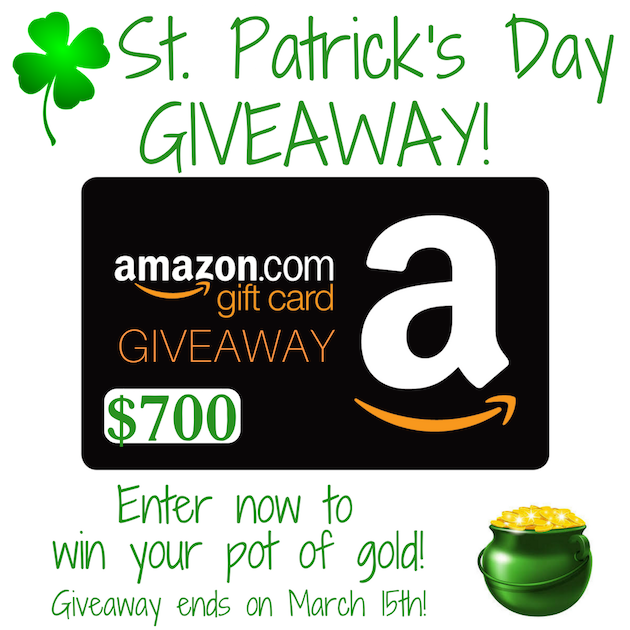 Thanks to everyone who entered this $700 Amazon St. Patrick’s Day Giveaway! We teamed up with some great bloggers to bring you this giveaway just before St. Patrick’s Day a few years ago! Be sure to visit all the awesome bloggers that helped us host this giveaway! I’m on accutane so I would buy some nice moisturizers to calm the dryness on my face and body! I would like to save it and use it for my grandsons for Christmas. I would use this towards Christmas presents! If I were to win, I would buy a pair of gym shoes, some pet supplies, then save the rest for gifts. I would spend it on my wish list. I have a couple items, plus having a birthday party for my mom next month this would help so much. that dish does really look good. I will spend it on our summer vacation! I would put the winnings towards remodeling our kitchen. Our current one is 8’x9′ with three doorways and chimney going through it! Ack! Thanks for the chance! 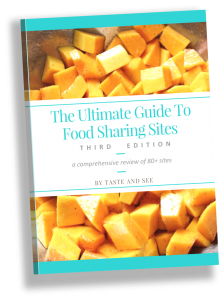 Love finding new food bloggers! Food is the best medicine!! There r so many things we need. I would love to be able to stock up on some items that are necessary for the house. I also would love to be able to buy my Mom a nice Mothers Day gift. She is 82 and I’ve never been able to really get her something nice. I would buy new bedding and a roomba vacuum…. I’ll be turning 47 soon and I would but textbooks and school supplies. I’m going back to school! 🙂 I’m so excited. I really hope I win. This would be so perfect to help me replace so many things I had to give up when I lost my last home. I would get a small flat screen TV first and a cat tree for my fur babies. Nothing extravagant. Just everyday essentials for the household. Those type of things add up! As much as I would love to spend it on myself, I most likely would end up spending it on my children and household items. I would buy some new dishes and silverware. I just moved and don’t have much to eat on or with. I would stash this away and use it for Christmas … what a wonderful Christmas our family could have if I won this ! thank you for the opportunity … Fingers Crossed ! I would put it towards the kitchen cabinets. We bought a diy & the original cabinets are gone, and looking to replace & update. TY for the chance. I would use to get a mattress here since we are sleeping on air mattress right now since our previous mattress was sagging after just 5 years . I would probably of the money to replace my ipad that has seen better day with hospital stays and doctor visits. I would probably get some stuff off my wish list if I won. I would also replace the Fitbit that I lost. I would use the Amazon gift card to buy my kiddos new Spring clothes! I would also use it to celebrate both of my daughters’ Birthdays, which are both in May. 🙂 I will definitely b making this pie, it looks absolutely delicious! My family is going to love it! I would spend my winnings on getting a new refrigerator. Mine has been acting up and the door isnt sealing right. Thanks for the chance. I would spend my winnings on some kitchen gadgets and organizing home decor that I’ve had my eye on! I need a new tablet . . and some books . . and maybe a couple of DVDs. I would buy myself an iPad and give the rest to my son to help him buy what ever supplies he needs to go back to school. I would buy a new computer; thanks for having this giveaway! I’d use the prize for Christmas presents and ordinary items we need. The pie looks amazing!! !We just added on a second story deck, and I would use it to buy an outdoor speaker, lounge chairs, table, and some festive summer lights. Thanks for the chance! Thank you so much, Robin! Good luck! I would spend some on my son for his birthday and also get a few new decor pieces for our house! I will buy a blender and an Air Fryer with my winnings. I would put it towards some needed household items. I would buy something for my entire family to enjoy. Thanks for the giveaway! If I won, I’d use the money to help pay for my anniversary trip to Cabo this summer with my husband! I would use it buy some bulk items for my pantry and save the rest for when we need it. I would buy a simple camera then save the rest. I would get some new dishes, pots and pans, and silverware for my kitchen. I think that since I am on a fixed income, SS disability, I would probably hang on to the money until Christmas. It would help tremendously. Thank you for the opportunity. I need some new camping gear for this spring and summer. I would spend it on books. I am a bookaholic. Great giveaway!!! I would use the money to but items from my Amazon Wish list!! I would purchase pots and pans. I definitely need new ones. Also start shopping for Christmas and birthdays. Thank you for the chance to win. Good luck everyone! Hmm an Amazon gift card for 700 bucks. I’d probably buy a bit of food, and maybe use the rest for a new computer. I would spend it on new clothes for my husband and I. Maybe a little bit of new makeup for myself too. Wow, I dunno. It would be a windfall for sure. I would take the hubby out for a steak and then buy myself an IPadMini. If I win i would use the money to buy a new tv and save the rest for all the family birthdays I have coming up. Pick me pick me. I love Amazon. i would like to get my husband a new grill! I would use the gift card to buy a new set of pots & pans. Ours are old and in desperate need of replacement! I would buy a Kitchenaid stand mixer. I would save it and start my Christmas for my grandkids. I would put it toward a laptop or toward my son’s birthday or Christmas presents. I also need new bedding. I would use the Amazon GC to buy gifts for my family. I would spend most of the amazon card on my grandsons and my daughter.The only thing that I would want to get for myself would be a good pressure cooker. I would buy a new platform bed and mattress. I would spend my winnings on an adjustable rectangular table and chairs set for my grandsons to use as their “homework station”. If I won I would apply it to my Amazon account and save it to buy Christmas presents. I would add it to my laptop fund. I think I’d buy new sheets, comforter and towels. Time for a spring refresh! I would buy my husband and kids new shoes and clothes. I would buy a new laptop, my computer is on its last transistor. Two new tires and paying bills! I would use this money to get my kids new beds! Hi Linda! This giveaway is open to US residents only! I’ve been wanting a Juvent. I would put the money towards it. I would buy items for my classroom (a laminator, laminating pockets, paper, ink, craft supplies) and throw a fantastic St. Patty’s Day Party for my students! I would buy things for my apartment. I am having to start from scratch scratch but have not had the money to get the things things I need. They’re are a bunch of books & essential oil supplies that I’d buy if I won the gift card. I am for sure gonna try this recipe ! Sounds awesome ! There are 2 things I would love to do if I won. I would treat my daughter to a Birthday Surprise , followed by spoiling my other 2 grandchildren whom I still haven’t met in person yet. (They live in another State and I am disabled from a car jacking 10 years ago) Thank you so very kindly for the opportunity. I miss them so much and I know the oldest one had a growth spurt and needs new clothing and shoes. Thanks again and Enjoy your week! I’d spend my winnings on stuff for the garden. Thanks for the opportunity. I’ll definitely be buying a new set of pans and maybe some other kitchen gadgets if I’m the winner! If I won, I would hold onto it until the fall and use it for Christmas presents. I would buy a Tablet with the money if i won.. I would buy some baby items and household necessities! It would be awesome! I’d get my schoolbus spray insulated… and get a massage. I will most likely buy supplies for either crocheting or sewing gifts for my family and friends. The first and foremost I’d buy a Ipad for myself and a handbag maybe some books. would spend on a little bit of every things.books and gifts for family and bet stuff for my cats. The pie recipe looks delicious! I would probably use the money on clothes and things my grandaughters need. Thanks! Groceries and save some. No savings acct here. Need to start one. amazon…ok im buying a wardrobe thanks for letting me win! Comment below this blog post to tell us how you’ll spend your winnings! im going to vegas….what happens there stays there…probably the money! I would get things that we need for the house. FIRST I WILL BUY ALL MY HEALTHY FOOD AND CLOTHES + PERSONAL ITEMS. My family needs a new oven/range. So if possible, we’d probably get that. I’d get new clothes for my son. He’s growing so fast. I can’t keep up with him! My daughter has a birthday coming up so would get her something nice. What a great site! 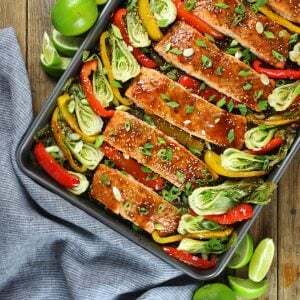 I’d love to get some pans off of Amazon to cook some of these recipes up! I will get some early Mothers Day shopping done and some books and games for myself! I would get my son a dsi xl for his birthday and save some for Christmas! I would use it for a food dehydrator and a new pressure canner. I love D&G light blue perfume.I’d get a few bottles. That and stock up on it’s a 10 miracle hair care products. They’re a bit pricey, but the best that I’ve ever tried. Thanks for the chance!!! I would buy my school books and then something fun for my kitchen! Maybe the vitamix I’ve been eyeing for years?? Thanks for the opportunity! Shouldn’t the bay leaf be removed ? Hi Liz, thanks for visiting! Yes, the bay leaf is removed just before you cover with the puff pastry dough. 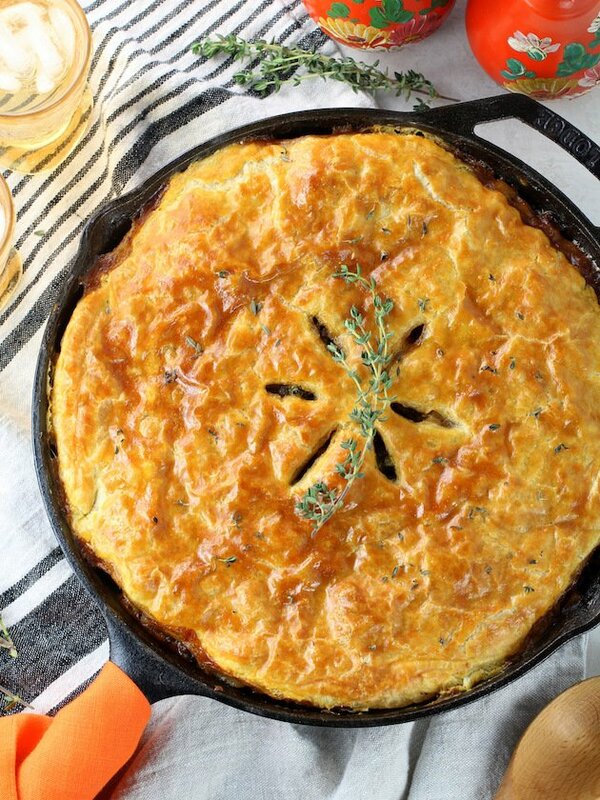 The full step by step instructions can be found here: https://tasteandsee.com/cottage-beef-pot-pie-potatoes-parsnips-recipe/. It would be wonderful to win! I’m sure I would have no trouble finding things to buy on Amazon! First my wish list, and then who knows. 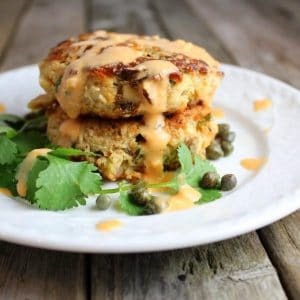 This is the first time I’ve found your blog – it looks like there are lots of great recipes here for me so I signed up for your newsletter too. I would buy my kids all new shoes since they seem to grow out of them faster than I can keep up. Well first off I’d get my dream kitchen table that I always wanted it’s a marble look with black chairs. I am in love with it and I will have enough to get my dream headboard for our Queen size bed frame we have. It has it’s own little drawer and top on both sides it’s pretty epic. I love it. Thanks! Love this dish. And I’d love to enter the contest. Is it for everyone or just US residents? I’m Irish so I’ll definitely share this with my relatives. Love the photos! I would love to furnish my kitchen with new dinnerware and buy my mother something if there is money left over. I need a new couch! I would use this for some new kitchen appliances. Nutraninja pro is top on my list. I would definitely put this towards birthday and holiday gifts for the next year! I’d spend it on some new computer parts. I love your idea to top it off with puff pastry. 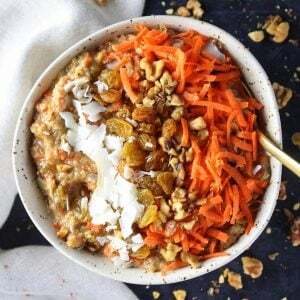 So easy and it looks so delicious! My birthday is the day before St Patrick’s Day (Which is my mom’s birthday) So I think I will treat myself a little. And I’ll get my mother a little something nice. I’d invest in a Kindle …. I’ve been wanting one for years and since I love to read it would make my life a lot easier. Then I’d order a bunch of books …. I try to read at least one a month. I might buy baby furniture for my newest grandchild. i would first buy a new kitchen aid mixer to replace my 15 year old one. and get lots of coffee! I’d spend the gift card on clothes and stuff for my hobby/passion: fountain pens lol. I’d spend the rest of the stuff for my family. I would get some new clothes for myself and my son. 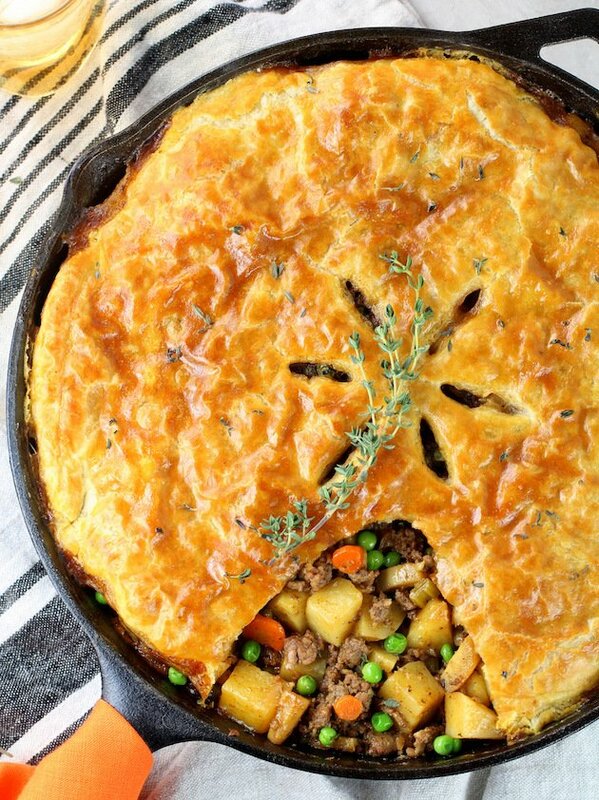 The recipe reminds me so much of the beef pot pie my mother used to make when I was young. I would purchase a serger for my sewing room and some books from my wish list! I’ll have to try this recipe out. I’ve recently got into cooking for myself and for my dog. 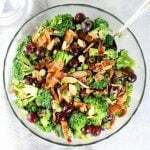 I could really use the Amazon gift card for a food processor, microwave, pots and pans, stainless steel French press coffee maker, microwave safe glass bowls and other items for the kitchen. I would use the amazon gift card to buy birthday presents for my 3 children. I’m sure there would be some left over to buy something nice for myself as well. I would like to buy a juicer, or maybe a recliner.. both of which I need. I need a dining room set. I would get new stuff for my apartment. First off I would smile a lot! I love to read so books will be high on my list! To quote Dr Seuss, “The more that you read, the more things you will know. The more that you learn, the more places you’ll go.” That about sums it up! This is one heck of a sweep – thank you! I would save half of it to use on Christmas presents for our kids. The rest I would use to get some new dishes and silverware. First of all I would be shocked if I won. I would like to get the Nintendo Switch and the Zelda Breath of the Wild game. I would do a few renovations around my house and then, early-shop for the holidays! I would use the money to buy a new laptop for my Mom. I would get something new for our new home. There are so many things in my amazon wish list that I do not know where to start.. I really need a new set of pots and some Thanksgiving china..
My husband is an EMS pilot and has wanted to go to the annual helicopter conference for many years but the tickets are too expensive. I’d love to use this money and send him! LOL…let me explain. I would use Amazon to purchase my normal food and household products and that would make it possible for me to save my budgeted normal money for his ticket. I would use it to buy birthday gifts for my family…all four of them within a month of each other! lol would be very useful ^_^ thanks for hosting such a great giveaway! I will put the winnings in my savings account and spend it on Christmas. I would buy some new dinner plates for the house-mine have chips in them and then let my husband get some tools. I would spend it on things my grandchildren need, including furniture for the one not yet born. I’d buy sewing fabric to make new curtains and drapes for our home. 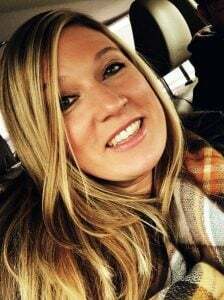 I would love to treat myself to a new dishware , I am also in need of new baking and cookware, so they are on my top list, but I would love to treat myself to some fun girly things, like make up, a new bottle of perfume, new hair brush would be nice also.. I would buy a few things that have been on my Amazon wishlist for awhile. I would also buy some gifts for upcoming birthdays. I would love to spend this on all the items my daughter will need to get settled into a dorm room in the fall! I would use the money to buy a new laser printer. The printer that I have now is the cheapest printer on the market and really does not work that well. I need a new vacuum. Thank you for the chance!! I can’t even imagine having that much money to spend at Amazon! I would probably get myself a new laptop!!! Then, if there was anything left, I would get my son something. God bless all! I will use it on back to school shopping and birthdays coming up and this would be such a blessing! I would finally get my kitchenaid mixer! Thanks! I would buy a tablet for my friend. he’s been wanting one for a while and the rest left over it i would buy my mom a birthday gift. I would spend it on things for the house…new mini blinds and a couple new doors. I would spend it on the things we need for our new house we are moving into next weekend. Bath supplies and rugs and blinds. If I won the giveaway, I would be some of it up for savings, and I would also use some if it to buy my sweet and deserving husband a birthday present! This looks so cozy and delicious, Holly! I love that it’s a one-dish meal — no sides necessary, too! Wow this looks delicious! I’ll have to try it out! I would probably spend the Amazon gift card on some new spring clothes! Thank you!